Our friend Tobias is setting us up an Event Log for recording things that occur at Coach Camp. We used it last year to keep up with more recent events occurring during the Camp AND MORE IMPORTANTLY as a means for recording information that was happening in the Camp. To get a feel for what was captured last year, drop by Last Year’s Log. BTW, a big shout out for AgileLib.net in general. It’s a tremendously valuable online resource; please consider joining, using, and contributing. New Sponsors + Agile Alliance Membership opportunity! I wanted to take a few moments and welcome and thank our newest two sponsors: Temenos and the Agile Alliance. Both of these great organizations join our impressive roster of sponsors. Temenos runs the annual Systems Thinking in Action conference promoting growth and understanding in systems thinking. They also have Temenos retreats; these are intimate growth and vision retreats in containers of safety (Temenos is Greek for container). A couple of your organizers have been on these retreats and we can say they are deeply moving. The Agile Alliance the non-profit supporting the adoption of Agility as described by the 4 values and 12 principles of the Agile Manifesto. With their sponsorship, Agile Coach Camp can offer a yearly membership into the Alliance for $10. We’ll do this during registration as you MUST attend to get the offer. You are not required to join, and if you are attending the Alliance’s Agile2015, you payment for that conference automatically gets you the yearly membership. If you aren’t attending though and want to join, just bring $10 to registration and we’ll get your name and email to pass to the Alliance so they can register you. The Alliance has fantastic resources for members and runs occasional virtual conferences as well. 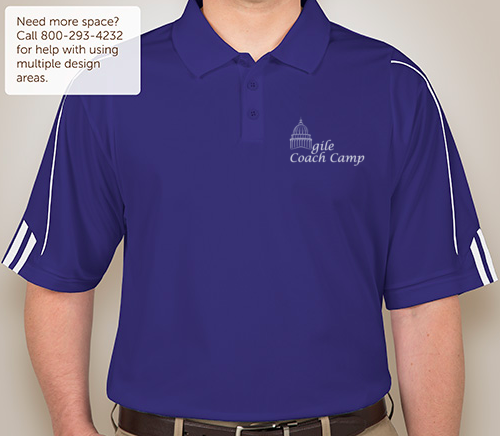 Agile Coach Camp Polo Shirts! We’ve added a new ticket type to Eventbrite so that you can get a high quality Adidas polo shirt with this year’s Agile Coach Camp logo embroidered on the front. The cost is $50 per shirt; at about 25 or more ordered, the volume discount will start letting us make a small sum to add towards additional goodies at the Camp (additional food or maybe rent a space for lightning talks on the Friday). If you are interested in a shirt, drop by the Eventbrite page and buy a ACC Shirt ticket. If you want one and aren’t attending Camp (why not!? ), go ahead and purchase one, then contact Paul Boos (@paul_boos on Twitter) and we’ll make arrangements to ship one to you anyway for $10 (again there will be an overage that will be used to help pay for the camp). Look as smart as the folks that are attending! First, the event is shaping up well; we have Tricia Chirumbole as our Open Space facilitator. She actually stepped up several weeks ago and I failed to get that published / (failure = I learned something). We’re very excited to have her and she helped us shape our super Theme: “Expanding our art to sculpt effective 21st century organizations”. Excella Consulting joins our roster of sponsors; with their support, we’re on our way to providing an outstanding Camp. If you haven’t checked out the Venue yet, you should! This venue, besides being a great historic building, is also a non-profit that helps improve racial justice. We’re very excited to be working with them since our payment for the facilities directly helps them. Our hope is to raise enough funds that we can also make an additional donation to them. Thank You to Leading Agile! Leading Agile has long been a supporter of Agile Coach Camp and we’re happy that they have reconfirmed their commitment to improving the craft of agile coaching by sponsoring this year’s Camp. Please take a few moments and thank Mike Cottmeyer and his crew when you have a chance. If you would like to become a sponsor, we’d love to hear from you. We’ve made it super easy to make the donation and we’re looking for many contributions as opposed to just a few large ones; after all this is a community! Newly Themed and Registration is Live! You can read more about the theme through the “Our Theme” menu item; we hope you find it as inspirational as us! And with that, we also took our registration live! Drop by and purchase tickets!